This product meets Mil Std 209 and is designed for restraining cargo on military equipment such as tactical wheeled vehicles. It is referred to as a "cargo tie-down provision" within the Mil Standard and meets the applicable requirements of Mil Std 209. Type 304 Stainless Steel offers excellent corrosion resistance over conventional carbon and alloy steel tie downs. Mil Standard 209 excludes this tie-down as an internal cargo tie down for aircraft or ISO cargo containers. This item may not be used for lifting unless proof tested. This item is available in alloy steel with added strength; see AJ12A00-DS26, which also meets Mil Standard 209K. Materials: Material is Type 304 Stainless Steel. For lifting purposes, where a 3:1 safety factor to yield is required, the WLL (work load limit) is 1/3 of the max. Load without yield. When proof testing is required, the proof test is two x the WLL. 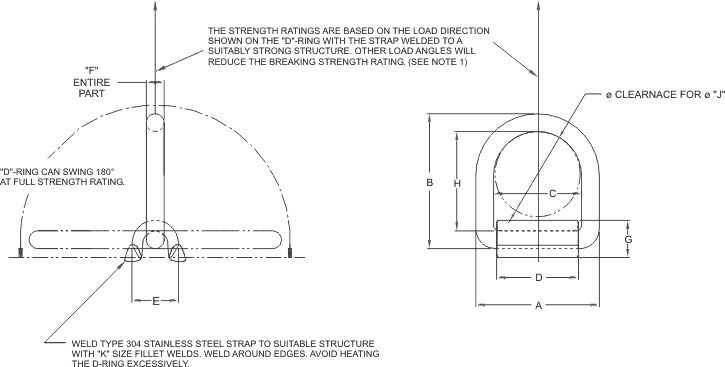 For Mil STD 209 conformance, the max load without yield is used to determine the use capacity. Lifting D-ring and straps are by request only and have additional cost.